During the last 20-odd years, the fine folks at Pixar Animation Studios have always made films on their own terms. Experimental shorts like Luxo Jr., Tin Toy and Knick Knack paved the way for Toy Story (1995), carving out CG animation as a serious film contender in the process. Through it all, they've managed to maintain an incredible winning streak: all of Pixar's feature-length efforts have enjoyed critical and commercial success...and it doesn't look like they'll be stopping anytime soon, lucky for us. Director Brad Bird's first animated effort, The Iron Giant (1999), was on equal ground with some of Pixar's finest work. Employing a seamless blend of CG animation and traditional hand-drawn artwork, this touching story of a boy and his fifty-foot tall robot from outer space enjoyed critical acclaim...but flopped at the box office, unfortunately. Still, there was an undeniable stamp of quality and passion on display, enough for audiences to realize that Bird would enjoy future success in animation. Both creative forces would meet shortly thereafter, since Bird had a working relationship with Disney and befriended Pixar co-founder John Lasseter along the way. Their first project together was The Incredibles (2003), a clever film about superheroes living awkwardly in the suburbs. Though I was never a big fan of team-themed funnybooks growing up (like The Fantastic Four or X-Men, for example), The Incredibles' refreshingly honest take on such an unusual family life anchored everything nicely. Bird's follow-up under the Pixar umbrella, Ratatouille (2007), tells the story of an unusual rat who dreams of becoming a famous French chef. Remy---our culinary protagonist---practices creative cuisine instead of dumpster diving, though his large family doesn't share such a sentiment. 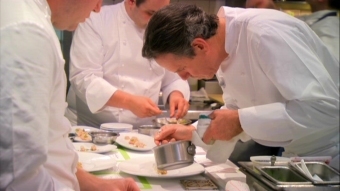 Driven by the words of legendary chef Auguste Gusteau (who reminds us that "Anyone can cook! "), Remy's quaint cottage life takes a detour and leads him to the bright lights of Paris. His idol's restaurant has fallen on hard times, due in part to a scathing review by a grumpy food critic named Anton Ego---but with the help of a clumsy young man named Alfredo, Remy's culinary experience might just save the dat. Still, the furry chef is torn between two paths of life: should he remain with his family or pursue his dreams? Executed with impeccable visual flair, Ratatouille is perhaps the most sophisticated CGI film to date. Pixar's commitment to quality shines from start to finish, carrying the story with colorful characters, a strong atmosphere and plenty of clever sight gags. A large portion of the proceedings are told from a rat's-eye view, allowing for plenty of larger-than-life situations and obstacles to overcome. Still, it's the film's charming conclusion that makes Ratatouille such a memorable experience: we realize that it's all about a passion for food and the memories it creates. From top to bottom, this is a satisfying meal the whole family can enjoy. 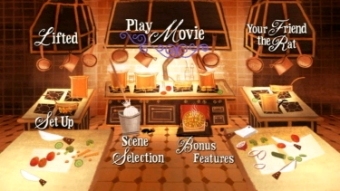 Presented on DVD by Disney, Ratatouille should please fans who saw the film theatrically. Though the bonus features are surprisingly slim on the whole, the quality of this entire package---especially the flawless technical presentation---is easy enough to see. All things considered, fans of Brad Bird's past efforts and Pixar's back catalogue should find plenty to chew on. Let's take a closer look, shall we? Presented in its original 2.35:1 aspect ratio and enhanced for 16x9 displays, Ratatouille looks about as perfect as standard definition gets. Boasting a bold, vivid color palette, strong image detail and incredibly convincing textures, this film maintains Pixar's commitment to polished, stunning visuals. Digital eyesores like pixellation and edge enhancement are nowhere to be found, rounding out the visual presentation nicely. If this isn't one of the best-looking DVDs of 2007, what is? Though Ratatouille is undoubtedly a dialogue-driven film, the Dolby Digital 5.1-EX mix is lively and dynamic. Voices are clean and clear throughout, while directional effects, rear channel activity and strong music cues fill the soundstage nicely. Paired with such an exquisite visual presentation, certain sequences could easily be considered demo material. Optional English captions for the deaf and hard of hearing are included during the main feature and bonus material. Seen above, the animated menu designs are basic and easy to navigate. The 111-minute main feature has been divided into 31 chapters, while no obvious layer change was detected during playback. This one-disc release is housed in a standard black keepcase and includes several inserts and a handsome embossed slipcover. Like Cars, there isn't a great deal of extras here, but what's on board is certainly worth your time and attention. A pair of Short Films stands alongside the main feature: "Lifted" (5:06) was shown theatrically before Ratatouille and tells the story of an extraterrestrial Driver's Ed class. Directed by legendary sound designer Gary Rydstrom, this clever little diversion is a welcome inclusion. "Your Friend the Rat" (11:19, below left) is hosted by Remy and his brother Emile; telling the history of their species in colorful fashion, it's an interesting lesson told from a unique point of view. Remember, fleas caused the Bubonic Plague! Also included is "Fine Food and Film" (13:57, below right), a short featurette with director Brad Bird and Thomas Keller (owner of pricey dining establishment The French Laundry). They parallel their artistic contributions in cinema and cuisine, sharing a bit about their early careers and why they chose them. Both are passionate about their work, demanding perfection but doing so with dedication and unbridled enthusiasm. This charming and casual chat is more of a companion piece than a bonafide supplement, but it's interesting nonetheless. Next up is a collection of Deleted Scenes (3 clips, 15:10 total) with video comments by Bird and a few members of the crew. 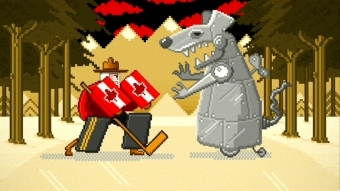 These three clips---entitled "Chez Gusteau", "Meet Gusteau" and "First Day"---are presented in animated and 3-D storyboard format, often accompanied by clips from the film's score. These are mostly filled with minor character moments, but they're still worth a good look. Sharp-eyed viewers will also discover a few Easter Eggs found on the main menu (timing is everything! 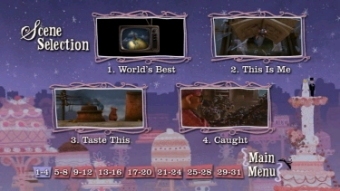 ), which include a mock rat poison commercial and a few alternate film titles for Ratatouille. A few Previews are also included, but the film's trailer is nowhere to be found. All bonus features are presented in anamorphic widescreen and include optional English captions for the deaf and hard of hearing. Bursting at the seams with texture, color and flair, Ratatouille is one of Pixar's finest efforts to date. The unique story and memorable characters are easy highlights, but it's the film's superb visuals and atmosphere that really draw us in and hold our attention. Disney's one-disc package isn't exactly loaded with bonus features, though the flawless technical presentation more than makes up for it. All things considered, those who like their animation served with style should find Ratatouille a satisfying feast indeed...and one that can be enjoyed many times over. Highly Recommended for hungry audiences of all ages.